Methicillin-resistant Staphylococcus aureus, also known as MRSA, is a bacterium that may cause serious health problems in humans. This bacterium developed resistance to beta-lactam antibiotics: penicillin and cephalosporin. Hospitalized patients with open wounds and a weakened immune system are at highest risk of developing MRSA infection. MRSA bacterium spreads by two main routes. First one involves direct contact with the infection carrier, for example, with person suffering from MRSA infection. The second one involves direct contact with object infected with MRSA bacteria. It takes approximately ten days of incubation before the first signs and symptoms of the infection occur. The virus is highly transmittable and the carriers are often spreading the bacteria unaware of the presence of the virus. Almost 2% of the general population is the carriers of the virus, but in the hospital surroundings this percentage is even higher and it goes up to 7%. Patients may come in contact with bacterium from the contaminated medical equipment. Medical workers may also spread the bacterium if not wearing protective clothes. MRSA blood infection takes place when the bacteria, normally found an skin and nasal passages of healthy individuals, gets into the body through a scratch, cut , catheter or breathing tube. The infection usually starts as a small red bump that looks like a pimple or an insect bite. In the next stage of the infection this small bump may turn into a painfully inflamed abscess. In some cases bacteria and infection stays on the skin, but in many other cases the infection turns out to be a serious life-threatening condition. Severe form of a disease is most commonly found in hospitalizes patients with compromised immune system. The spreading of a virus is also faster in the hospital surroundings. Severe infection affects the bones, joints, and wounds, whole of the bloodstream, heart and lungs. 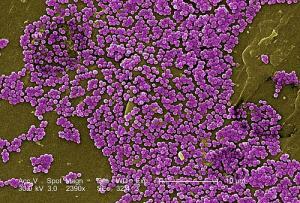 Symptoms of the severe MRSA infection include swelling of the skin and painful sensation, discharge from the abscess, high fever, inflammation of the affected area and the warm sensation, pain in the chest, headache, and weakness in the muscles, tiredness, skin irritation, and difficulty breathing. In case of a mild infection, treatment will consist of draining of the skin abscesses. However, blood infections are extremely hard to treat as the virus is resistant to the most effective antibiotics. The mild positive effect of antibiotic treatment is seen in clindamycin, doxycycline, minocycline, tetracycline, trimethoprim-sulfamethoxazole, and vancomycin. Prognosis are usually dependent on the severity of the infection.